projects in store for you today! Today we are featuring a canvas and two layouts!!! I LOVE This new paper line that was used for the December Kit. I cut a blue piece of paper to fit the canvas and inked the edges with a Maraschino Cherry Powderpuff Ink pad. I glued the paper to the canvas with Beacon’s 3 in 1 adhesive. 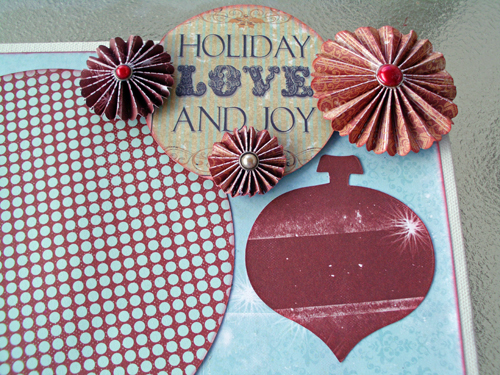 I cut three different size circles out of the various paper and layered them on top of each other and then used a circle cutter to cut out the “Holiday Love and Joy”. I will add one or two photos from Christmas Day to the circles. I used the Grand Calibur Die Cut Machine to cut the ornament and rosette flowers. When I folded the rosette flowers I added pearl brads to the center for added decoration. The two ornaments in the upper left corner of the canvas are pieces of grunge board that I colored with the Maraschino Cherry Powderpuff Ink pad and added some stickles to as well. 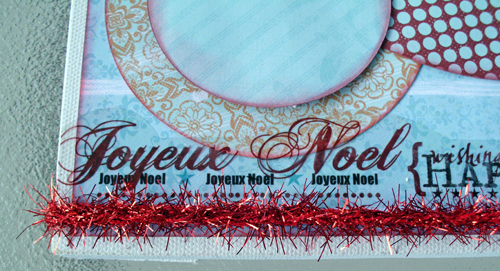 The tinsel along the bottom is wrapped around the back of the canvas and stapled to the backside. The Wishing you Happy Holidays Sticker along the bottom is from Pink Paislee. I inked the edges of all of the pattern papers and chipboard pieces with blue Hawaiian powderpuff chalk ink. 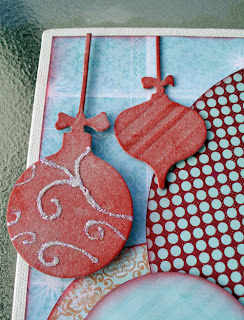 I used amaretto chalk ink on the “Winter Blessings” stamp card as well. I used my digital Silhouette cutter to create the snowflakes. I brushed over them with the blue Hawaiian ink too. 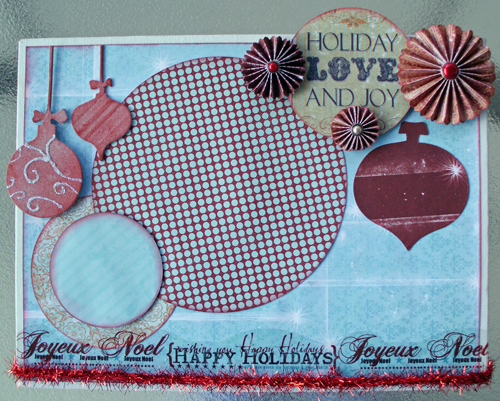 Everything else used on this layout came from the December Club Q kit. I know I say this all the time, but the 3-in-1 Beacon glue is great for adhering chipboard to paper. I also used it to adhere the crystals to the center of the snowflakes. I love the strength of this glue. 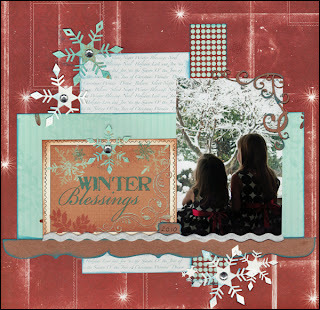 Here is a layout I created using one of the beautiful kits from the December Club Q kit offerings. Burgundy, Cream and White Cardstock. Two additional pieces of Designer Patterned Paper From Club Q Kits. Midnight Confessions and Mocha Mama Powder Puff Chalk Inks. Design Note: I used the gold acrylic paint to ink the edges of the poinsettias as well as the photo mats. The December Club Q kits are BEAUTIFUL! They are put together so well and are very easy to complete! They would make the perfect gift for the seasoned scrapper as well as those just starting out! Beautiful card and layouts. I love the non traditional colors and such beautiful paper. Love the little white tree and ornaments. Beautiful work by all the designers. These are gorgeous, thank you so much for the inspiration!